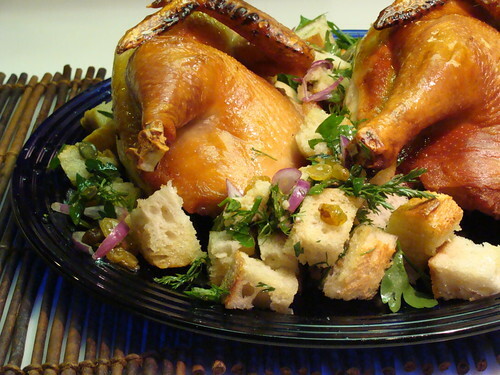 Not Quite Nigella recently posted a delicious picture of Zuni Cafe's Roast Chicken with bread salad. After a difficult work week and work weekend, I decided it was time for a little Roast Chicken therapy. The smell and warmth of a roast chicken--unless you are a vegetarian, I imagine you know the feeling. I ended up with 2 halves chicken. I wanted an organic free range bird, and definitely was not planning to give Perdue or another other chicken mill birds a try. Got into the grocery store to find all of the organic whole birds had been sold. It is high holidays for Jews this week, and as the kind woman in the aisle said to me (the woman who had gotten the last bird) everyone is making chicken soup. She was nice enough to offer me her bird, but I couldn't take it. My desire for roast chicken because work sucked isn't close to her need to satiate her desire to experience her cultural and family traditions. So, I got two half birds and made my way home. For the bird, I followed the Zuni Chicken recipe fairly closely. 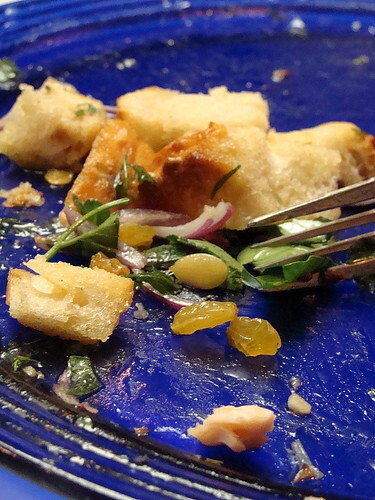 For the Bread Salad, I used the Zuni recipe as a guide using cubed Roasted Garlic bread, red onion, pumpkin seeds, apple cider vinegar, yellow raisins, dill, parsley, and roasted chicken drippings. This salad was pure heaven. Great looking skin on that chicken...Zuni-fy! Roast chicken is a panacea. I can't stand thinking about how the juice from the chicken would drip and mingle with the bread salad. I gotta stop looking at foodblogs late in the evening!! Your blue plate makes my day. It's a world of stories in one little pic. Yum! Maggie: I feel the same hungry when I read them late at night. And, I totally agree about roast chicken. chou: you know, they are such cheerful plates. cheap at the thrift store. Lorraine E: thanks for visiting. My desire for roast chicken because work sucked isn't close to her need to satiate her desire to experience her cultural and family traditions. Oh is this the one you make with the dry-brining method? It's a pretty nice way to season chicken and keep it juicy. Jude: indeed it is. Try it. cook eat FRET: try it. the salad is better than the chicken! 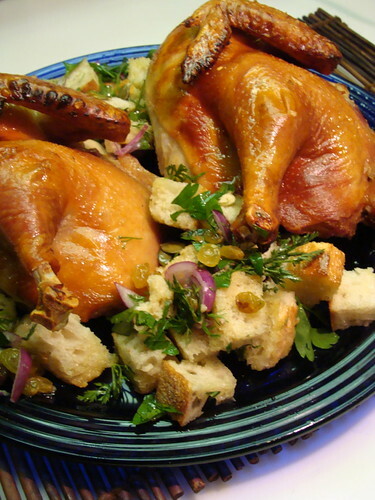 I've been hearing a lot about this Zuni chicken and bread salad but haven't tried making it. I'm afraid I'll mess it up. This dish looks fantastic! I wonder what she would have done if you did take the last bird? I love your creative license with the bread salad -- just imagining the flavor combos is a treat. I'm hoping Judy Rodgers would give you a high five for your creativity! Great looking roast chicken! And I must say it's interesting to roast 2 halves of a chicken. Question, does that shorten the roasting time and did you have to flip the chicken half-way since the chicken has been halved?